Zynga didn’t meet analysts’ already-low estimates in its just-released earnings for the second quarter of its fiscal year, in which it showed revenue of $332 million and lost $22.8 million, or 3 cents per share (according to GAAP measures). Analysts had predicted the company would earn 5 cents per share on revenue of $344 million. Zynga says it now has 72 million daily active users, up from 59 million in the previous quarter, and 306 million monthly active users, up from 228 million. Bookings, meanwhile, were $302 million, up 12 percent from the same period last year, but a sequential decline of about 9 percent from the previous quarter. The company also says it’s lowering its outlook for the rest of the year based on “delays in launching new games, a faster decline in existing web games due in part to a more challenging environment on the Facebook web platform, and reduced expectations for Draw Something.” It’s now projecting $1.15 billion to $1.225 billion in bookings for the year. 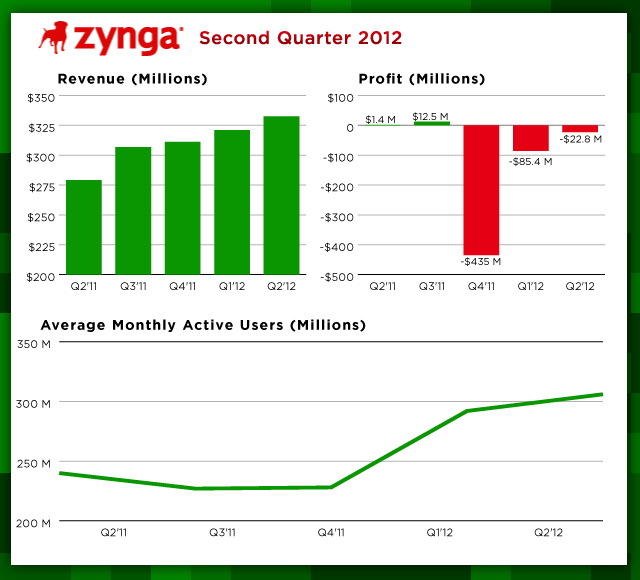 This is only Zynga’s third earnings report as a public company. Last quarter, it beat expectations, with revenue of $321 million and a loss of 12 cents per share (again, according to GAAP measures). Recently, the company also announced Zynga With Friends, a cross-platform “social lobby” for its own games, as well as those from other developers. If successful, it could alleviate critics’ concerns that the social gaming giant is too dependent on Facebook. As of 2:14pm Pacific, Zynga down 37 percent, to $3.18, in after-hours trading. The analyst conference call with analysts is scheduled for 2pm Pacific today.